June 8th – FocusOrg™ Workshop Join us for a day focused Lean thinking. Learn how to be better organized with the structure, process and people of your business. You will get the chance to be part of a mock team that works together to achieve organizational excellence. You will leave the session with tools to use in your own business. Curious? June 19th - Journey to Personal Excellence Speaking Engagement, Mill Creek, WA. Learn more about this topic and others here. If you are interested in any our speaking topics for your business or event, contact us today. Continue Being Excellent in the New Year - Reassess where you are in your New Year's resolution...are you staying on top of that promise you made to yourself three months ago? Are you continuing to exercise a new habit, stay organized or spend a little time for yourself? If your answer is 'yes', Congratulations! If your answer is 'no', Ceptara can help make it a 'yes'. We will be conducting our next Personal Excellence Workshop on May 18th. The core of the workshop is to help you achieve organizational excellence within your life. Whether it be in your business, your personal life or both. There is no greater reward than accomplishing a goal you have set out for yourself. Join us May 18th. Ceptara is in the news! Our Southwest region consultant, Ernie Borgoyne located in Gila County Arizona has been recognized by the county for his efforts in implementing Lean Six Sigma techniques. Read the full article here. Upcoming FocusOrg™ Workshop - We will be conducting our FocusOrg™ Game Workshop on June 8th. If you have not joined us for this event in the past, we invite you to connect with us for a day filled with thought and strategy. 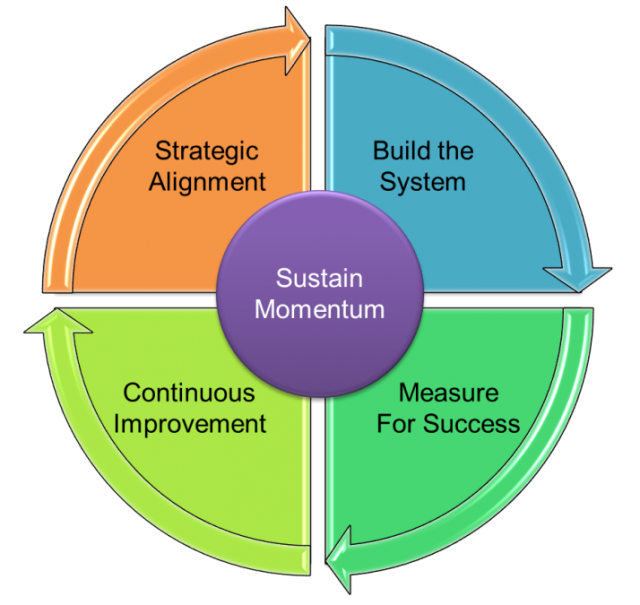 Based on our Five Steps to Achieving Organizational Excellence model (below), this session will introduce you to the underlying themes and tools in each step. Our integrated hands-on simulation, The FocusOrg™ Game, will allow you to experience the journey through the five steps. In the end, the workshop will help you understand how you can transform your organization and your life. College Courses by Ceptara - Everett Community College has teamed up with Ceptara to offer a series of Lean Six Sigma Green Belt Courses. We are teaching the Green Belt Foundations, Advanced Topics, Capstone and a Test Prep courses through the Corporate and Continuing Education Center. The program helps prepare participants to test for ASQ Green Belt certification. Get the latest version of Organizer for Outlook - Ceptara is releasing the latest version of our Organizer for Outlook in May. This latest installment will feature the ability to post directly to Twitter and LinkedIn. The 'Help' button will link you directly to our Getting Started Guide so you can quickly get an answers to your questions. Keep an eye out for the release of these features and more, start using them along with all the other great features our Organizer for Outlook has to offer. Like Us on Facebook - Get up to date information from Ceptara on Facebook. Daily posts keep you informed of the latest from us and news within the industry. Copyright © Ceptara Corp. 2011, All rights reserved, Privacy Statement.